PacLights LED Canopy Lights offer greater energy efficiency, life expectancy and quality of light than better than traditional Metal Halide fixtures it replaces. PacLights produces LED-based canopy lights that provide reduced energy consumption, extremely low maintenance, and superior light distribution characteristics. 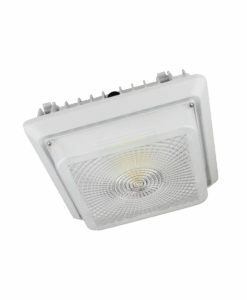 PacLights LED canopy lights are easy to install for retrofits and new construction. Compact, designed to also send a portion of light upwards, provides illumination over an indoor/outdoor area with a low-medium ceiling. Surface or conduit mount. Suspended mount (optional). Dimmable, optional microwave motion sensor. Recommend to use in parking garage, work shops, or other low bay applications. Slim design, provides illumination over an indoor/outdoor area with a medium-high ceiling. Surface or conduit mount, optional retrofit bracket for original 2'x2' fixture. Recommend to use in gas station, service canopy, or other similar applications. Ultra slim design, provides illumination over an indoor/outdoor area with a high ceiling. Also, the optional LED Canopy Light Retrofit Kit is designed to replace existing 2x2 metal halide light fixtures in gas station fuel pump canopies, easily and cost-effectively, it uses the existing metal halide light fixture mounting - no need to disrupt canopy seals during installation, eliminating potential roof leaks common with other canopy light retrofit procedures. The retrofit procedure also delivers the lowest installed cost - less time to install and that time savings is also cost savings. These retrofit kits provide all of the advantages of LED-based lighting over metal halide lamps including longer life, lower energy consumption, and better lighting characteristics – while delivering brighter light focused on gas pumps and fueling areas.